Visions of Jesus Christ.com - Marie-Julie Jahenny - Stigmatist. Images are of Marie-Julie Jahenny. Marie-Julie Jahenny was born February 12, 1850, in a little village in Brittany (Northwestern France), called Blain. Shortly after her birth, she was Baptized on Ash Wednesday, 1850. 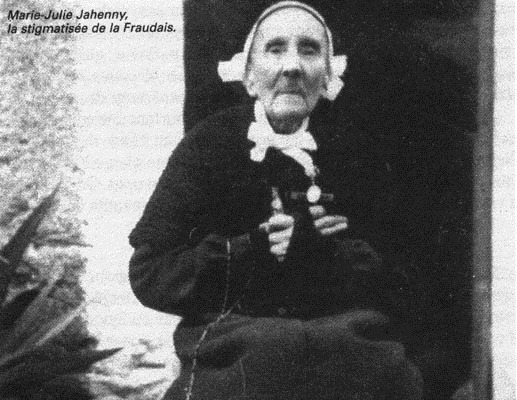 Marie-Julie Jahenny was the eldest of five children. Marie-Julie Jahenny was brought up by her simple, good parents in that lively faith. Her Mother was very devoted to the Virgin Mary. When she was 16 years old, Marie-Julie was placed in the service of a family. But her weak constitution allowed her to remain there only six months because Divine Providence desired her to live as a victim-soul in reparation for the sins of mankind which she gladly embraced with her whole being. She joined the Franciscan Third Order when she was in her early twenties. In 1873 she received from Heaven that most remarkable mystic gift, the Stigmata. From the age of twenty-three until her death, some sixty years later, she bore in her body the Wounds of Our. 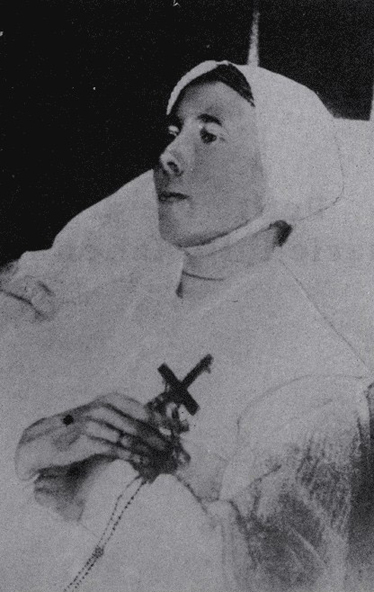 In addition to the Five Wounds of the Sacred Hands, Feet and Side, Marie-Julie suffered the Wounds inflicted by the Crown of Thorns and the Cross on Our Lord's Sacred Head and Shoulder respectively, the Wounds of His Scourging, those caused by the ropes with which He was bound, as well as other Wounds of a more mystical nature. As a result she was called “The Breton Stigmatist”. Marie-Julie lived her life of co-redemptive suffering (as a victim soul) in a little cottage in the hamlet of La Fraudais, Northeast of Blain. She fulfilled Our Lord’s desire for her to make reparation for the sins of France and the world. Marie-Julie was the wonder of the many scientists who examined her continually, the scorn of unbelievers and the proud, the admiration of her lifelong friend, Monsignor Fournier, Bishop of Nantes. She had the gift of recognizing a Transubstantiated Sacred Host from ordinary bread, as well as objects that were blessed and those that were not. Her gift also included recognizing relics and to identify from where they came, and finally, although she was illiterate, she understood hymns and liturgical prayers in several different languages. During a five year period, beginning on December 28, 1875 she survived only on the Sacred Host she received in her daily Holy Communion. As Dr. Imbert-Gourbeyre recorded, during this whole period, there were neither liquid nor solid excretions. She was completely insensitive to pain or intense light during her ecstasies. She also reported apparitions of the Blessed Virgin Mary and Jesus Christ through which she received prophecies about the end of the world, the Catholic Monarch, punishment for the sins of the people, the destruction of Paris through civil war, the Three Days of Darkness, and the coming of Antichrist. From the age of twenty-three until her death, she bore the stigmata. Marie-Julie Jahenny went home to the Lord on February 24, 1941.